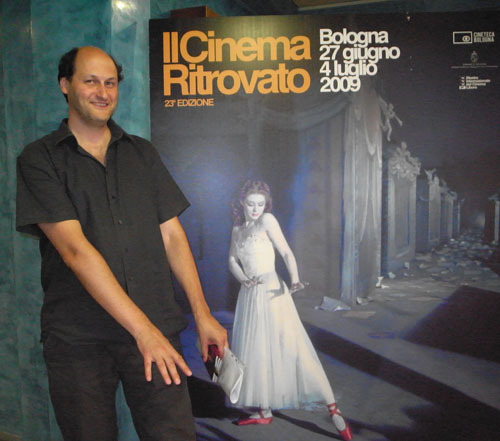 Guy Borlée, Festival Coordinator for Cinema Ritrovato, in a pas de deux with Moira Shearer. Like most film festivals, Cinema Ritrovato is many festivals. There’s so much on offer you can carve out your own mini-fests. You may meet a friend for lunch and learn that you two have seen none of the same movies. So here are some titles from my sampled version of Ritrovato. As Kristin pointed out in our last entry, we spent a lot of time in the 100 Years Ago thread. Things were definitely changing on screens in 1909. True, you still had your costume picture with suspiciously insubstantial walls and props, your gimmicky special-effects comedies (e.g., The Electric Policeman), and your chase films with people falling over and getting up and running on, endlessly. But you also had powerful movies like Capellani’s L’Assommoir, discussed by Kristin, and charming ones like Charles Kent’s Vitagraph Midsummer Night’s Dream. There were crime films like Tell Tale Blotter and An Attempt to Smash a Bank, with its peculiar slow reverse tracking shots linking the lobby and the banker’s office. There was Cowboy Millionaire, which presents the always-edifying spectacle of a buckaroo bringing his uncouth pals to the big city. There were wonderful Film d’Art items, not least Le Retour d’Ulysse, which had the most rapid editing pace of any 1909 film I clocked. There was even a lifelong romance told through the fate of two pairs of shoes (Roman d’une bottine et d’un escarpin). Louis Feuillade was one of the finest directors of the 1910s, but most of his earlier work that I’ve seen doesn’t suggest his mature storytelling skills. Of the 1909 Feuillades on display in Bologna, the two I found most intriguing were La Possession de l’enfant, about a divorced wife who kidnaps and raises her child in poverty, and La Bouée, a touching tale about a fisherman’s family about to lose everything. But the cherry on the sundae for me was a pristine print of a 1911 Feuillade, part of Eric de Kuyper’s program of films about financial crises. My man Louis did not fail me. In Le Trust, a businessman indulges in a bit of corporate espionage. He hires a detective (the sinister René Navarre) to kidnap an inventor and squeeze a secret formula out of him. The detective resorts to some unusual methods, such as hiring an actor to dress in drag and impersonate a rival’s wife. The inventor is kidnapped but outwits his captors with a trick that could have come straight out of Les Vampires. The plot’s outrageous surprises are played straight and brisk, and we can see Feuillade moving toward the compact, inventive staging of Fantomas and Tih-Minh. How could Le Trust not be my favorite movie of the week? Given my fondness for Russian and Soviet film, Kinojudaica was a thread I followed fairly closely. This imaginative program, drawn from a larger package assembled by the Cinémathèque de Toulouse, ran from the 1910s to the early 1930s. Véra Tcheberiak (1917) is probably more important for its subject matter than its fairly simple technique. 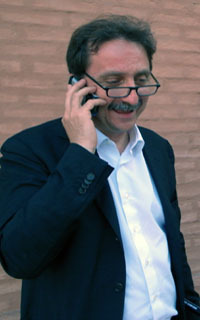 The two-reel film was the third to treat a famous case of anti-semitic hysteria under the Tsar. In 1913, a Jew named Beilis was charged with ritual murder of a Christian child, and it became Russia’s Dreyfus affair. More elegantly directed was Evgenii Bauer’s worldly, somewhat cynical Leon Drey (1915) which retains its fascination. (I wrote about its staging in an earlier entry.) But its intertitles still need to be restored. 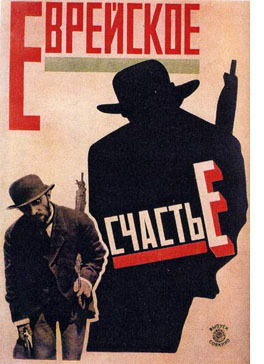 Two later films were strongly marked by Soviet montage influence. In The Five Brides (Piat Nevest, 1929-1930), a shtetl is threatened with a pogrom by a gang of bandits. The band will spare the citizens if five virgins can be offered to their leaders. Director Aleksandr Soloviev accentuates this dramatic situation with every trick in the montage playbook: fast cutting, low angles, handheld shots, dynamic graphic conflict, and even explosions and bursting waves as Red partisans ride to the rescue. The final moments are missing, but there is plenty to savor, including an emotionally complex scene in which the elders decide to sacrifice their five virgins and suffocate a young man who is trying to stop them. The film was revised for Russian release, but we saw the original Ukrainian version. No less engaging, though a little more formulaic, was Remember Their Faces (Zapomnite ikh litsa, 1931). A young Jewish worker devises a machine to speed the work of a tannery, but his efforts are blocked by saboteurs and anti-Semites. In a slap to the New Economic Policy, the chief villain is a private entrepreneur who wants to make the tannery uncompetitive. The scenes in which Beitchik is casually bullied by young thugs are quite strong. The final moments, when the bullies won’t even let Beitchik leave town unmolested, present the stirring image of the Komsomol youths marching to rescue him. Such support did not materialize behind the scenes: the film encountered censorship at every stage and was given a modest release. Despite a 1927 Party directive ordering films treating anti-Semitism as a threat to socialism, both The Five Brides and Remember Their Faces encountered obstacles at every turn, largely on the grounds that the Party was given too small or too passive a role. In a fine book accompanying the series, Valérie Pozner supplies details of how the films were censored and suppressed. 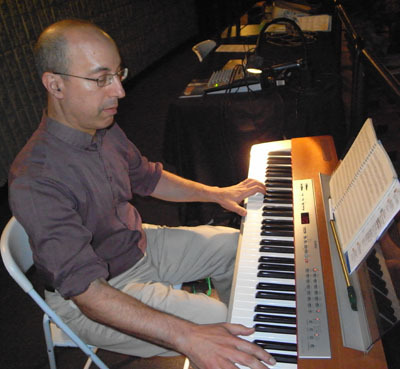 Donald Sosin gives us Scott Joplin’s “Wall Street Rag” (1909), uncannily appropriate today. One of the highlights of this year’s Ritrovato was the Capra series, featuring his surviving silent work and several early sound pictures. 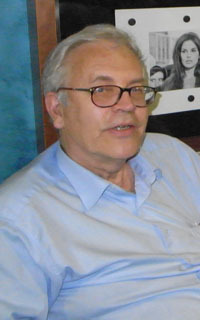 We were also lucky to have Joe McBride, professor, critic, and UW alum, there to introduce many sessions. I didn’t attend the talkies, having seen the batch except Rain or Shine (1930), but several of the silents grabbed my attention. Most seemed to be attempts by Columbia to hitch a ride on the bigger studios’ successes. The Way of the Strong (1928) is a post-Underworld exercise in hoodlum redemption, graced by vigorous action, swift cutting (4.3 sec ASL by my count), and nice juggling of recurring props (mirrors, pistol barrels, a book devoted to great lovers). And the plug-ugly hero is truly ugly, none of your Hollywood fake-ugliness; a face only a blind girl could love. Submarine (1929) is a take on the What Price Glory plots analyzed by Lea Jacobs in her recent book. Two amiable sides of beef brawl and drink their way through navy life until a woman comes between them. The sexual rivalry is compelling, and the suspense during a stifling undersea rescue is admirably sustained. The Younger Generation (1929) owes something to the back-to-your-roots impulse of The Jazz Singer. Based on a Fannie Hurst story, it tells of a Jewish family that rises into society because of the son’s business acumen; in the process, class snobbery makes them increasingly unhappy. I leave aside the silent version of Rain or Shine, which I found underwhelming, so as to focus on the most curious thing I saw at the festival. 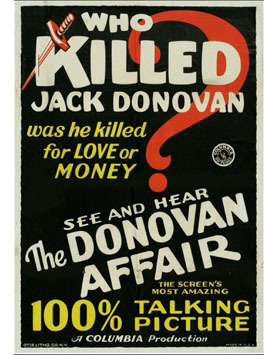 The Donovan Affair is a Philovanceish murder mystery from a play by the ubiquitous Owen Davis. It was released in April 1929, and it isn’t particularly good. But it nags me. 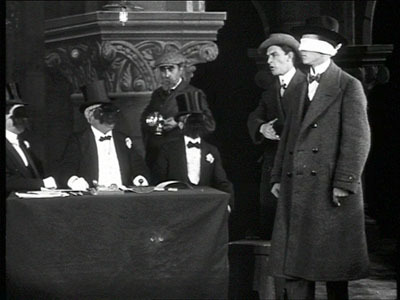 The movie was made in both silent and sound versions. Our print was silent, but it had no intertitles. At first blush it seemed to be the sound version without its track, sort of a 000% talking picture. The print’s average shot length is 9.3 seconds—too long for most late silents, but typical of some early talkies. Yet this did not look like any 1929 American talkie I have seen. It had silent-film lighting, some huge lip-sync close-ups, and very smooth cutting. Except for a couple of moments, it lacked the jerky reframings, the long-lens imagery, and multiple-camera coverage typical of shooting from booths, the common practice of early talkies (and the talking sequences of The Younger Generation). Capra’s setups sat well inside the action, as was the case in 1920s silents and as would be the case in single-camera sound films a few years later. Crazy as it sounds, I had to wonder if we were seeing a copy of the silent version made before titles were inserted! This is very unlikely. But if this was indeed an early talkie version, Capra was able to shoot sound with a fluidity that directors at bigger firms didn’t display—and in a rented studio at that, if the AFI Catalogue is to be believed. On the road and away from my research base, I can’t investigate further, but if you know more about the Donovan Affair affair, feel free to correspond and I’ll add postscripts. Whatever the provenance of that Library of Congress print, the other silent/ early sound Capras have been admirably buffed by Sony’s Grover Crisp and Rita Belda (another Wisconsinite). The prints’ sparkle and sheen prove that even a minor-league studio (which Columbia was then) could turn out gorgeous imagery, thanks in no small part to cinematographers like Joseph Walker and Ted Tetzlaff. 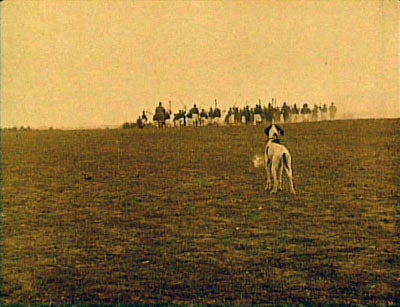 The Lewinsky Dog surveys the climactic battle in Karadjordje (1911). Be Patient! Department: Anke Wilkening, who was among those announcing the discovery of a new Metropolis print last year, gave us an update on the restoration process. The archivists are nearly done integrating the Argentine footage into the whole. Next comes the cleanup phase—awkward because the original Argentine print was heavily scratched and what we have is a 16mm copy and cropped for sound at that. So far, the restored footage is clearly making secondary characters like Josaphat and the “Thin One” more prominent. But even the Argentine print is lacking things known to us, as three clips illustrated. Getting everything in some order will take time. Anke promises another report next year. Box sets routinely attract attention at Bologna’s annual DVD awards, and this year things went according to form. The top prize went to Joris Ivens, Wereldcineast, a vast assembly of rare work by the Dutch filmmaker. Another generous package, Flicker Alley’s Douglas Fairbanks set, won best silent-film box set. (We have an entry on it.) Two more big collections, GPO Film Unit Collection vol. 2 (BFI) and Treasures from American Archives IV (Film Foundation) triumphed in the Sound Film and Avant-Garde categories. Other winners: the two Vampyr releases (Eureka and Criterion) and Berlin, Symphony of a Big City (Munich Filmmuseum) for their rich bonus materials; Vittorio De Seta’s documentary collection Il Mondo Perduto (Feltrinelli Real) and two studies of Pasolini’s La Rabbia (Raro) in the Rediscovery category. Cinema Ritrovato wisely acknowledges that DVD producers are contributing powerfully to research into film history and are making rarities available to viewers who live far from festivals, archives, and cinematheques. Not heralded—in fact, just sitting on the counter at the ticket booth—were still other DVDs, this time from Serbia. Sharp-eyed Olaf Müller pointed them out to me, and I’m grateful he did. Two volumes from the “Film Pioneers” series include a set of newsreels and, happily, the 1943 Innocence Unprotected (which Makavejev “decorated” in his revised version of 1968). A third disc consists of Karadjordje; or, Life and Deeds of the Immortal Duke Karadjordie (1911). This is the first Serbian and Balkan feature, and is thus, as the box text indicates, “one of a kind.” Same goes for Cinema Ritrovato itself. Gian Luca Farinelli and Peter von Bagh, two more we have to thank for a great festival. Just in time for Bologna, the historical journal 1895 has published a splendid special number on Le Film d’Art, ed. Alain Carou and Béatrice le Pastre. Feuillade’s Le Trust is available on the Gaumont early years DVD set and will soon be released on a Kino set drawn generously from the Gaumont collection. Keep your eyes open for early Capra features on Turner Classic Movies; several have run there recently. This entry was posted on Monday | July 13, 2009 at 12:52 pm	and is filed under Directors: Capra, Directors: Feuillade, Festivals: Cinema Ritrovato, Film comments, Hollywood: Artistic traditions, National cinemas: Russia and USSR, Silent film. Responses are currently closed, but you can trackback from your own site.